Well ladies the results are in from having YOUR say, firstly i wanted to create a poll out of curiosity, would there be anyone out there that has had the same experience as me? and secondly to hopefully give reassurance to others that you are not alone, we often hear of others suffering miscarriages and fertility issues but what are the real numbers for that? How many people are just like you? Im sure you will find that in 99% of the cases you fit right in with the rest of the women, some many feel slightly outside of the markers but that doesn’t mean you are alone, remember these results are only a small indication of the community, but these are honest answers. Are you surprised? Let me know your opinion! THANK-YOU to everyone that had taken the time to vote and speak out, not only are you helping statistics but you are helping many others in your own situation, and for that i cannot thank you enough, support is needed and we are all helping – one poll at a time! 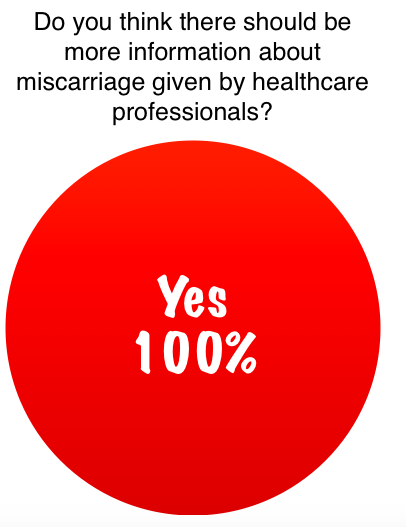 I am not entirely surprised about the figures, i had predicted the most common answers based on opinion, the one that sums up the reason for this poll was the final one,100% of you agreed there should be more information given about miscarriage, this was a current theme throughout results, is miscarriage such a taboo? Why are we not being given enough information in regards to symptoms to look for? I know this won’t change the outcome but we CAN change the way we deal with things, and finally, the most important number of them all, the one that REALLY matters, the one that you should be taking note of, the one you should be caring about..
100% of you said you was not alone, that you are strong, that you have had these results but come out the other side stronger, that you won’t be beaten and most importantly that you are still here to tell your story – and thats what keeps us all going.